Pumpkin Waffles are such a fun treat when the weather starts getting chilly! These are spiced with the warming flavors of cinnamon and nutmeg. Drizzle with warm maple syrup and serve with apple sauce for the perfect fall breakfast. Pumpkin waffles are the world’s best answer to leftover pumpkin purée. Ever have a half-empty, opened can of pumpkin purée staring back at you when you open the fridge? I don’t know about you, but it pains me to see food, or anything for that matter, go to waste. Heck, I even save egg shells and spent coffee grounds for compost. So, what can one make with the remainders of a can of pumpkin purée? Lightly spiced with ground cinnamon, nutmeg, ginger, and cloves, these pumpkin waffles are a fun way to change up a waffle breakfast. In this recipe we add a little finely ground cornmeal too; it gives the waffles just a little crunch. Trying to estimate the right amount of batter for the number of people is always a challenge. Here’s a tip: make more batter than you need, cook up as many waffles as the batter will make, and freeze the leftover waffles to heat up in a toaster for another morning. Let your waffles cool completely, then stack between pieces of wax paper (to keep them from sticking to each other) and transfer to a freezer zip-top bag. Squeeze out as much air as possible and place in the freezer. Waffles will keep for at least a month in the freezer before starting to pick up off-flavors or develop freezer burn. No need to thaw before reheating! Just pop them in the toaster and they’ll be piping hot in a few minutes. While maple syrup is certainly good with these waffles, make your morning extra special by melting honey and butter with a bit of cinnamon and drizzling on top of your waffles. Another decadent idea? Make some pumpkin spiced whipped cream! Serve with applesauce or apple butter on the side for a fantastic fall breakfast. Can’t get enough pumpkin? Check out these recipes! Updated November 15, 2018 : We spiffed up this post a little to make it sparkle! No changes to the recipe. Any leftover waffles can be cooled, wrapped in plastic wrap, and frozen. Unwrap and pop in a toaster or oven to reheat. Don't have buttermilk? Add 1 tablespoon of lemon juice to 1 cup and 3 tablespoons of milk, and let sit for a couple minutes. Or mix 3/4 cup of plain yogurt with a half cup of milk. 1 Preheat your waffle iron. 2 Whisk dry ingredients: In a medium bowl, vigorously whisk together the flour, cornmeal, baking powder, baking soda, salt, and spices. 3 Whisk sugar and wet ingredients: In a larger bowl, whisk together the eggs and brown sugar until there are no more brown sugar clumps. Add the buttermilk, pumpkin purée, melted butter and whisk until smooth. 4 Add the dry ingredients to the wet ingredients and whisk until smooth. When your waffle maker is hot, working in batches, ladle the batter onto the center of the waffle iron wells, not all the way to the edge, and slowly lower the top lid of the waffle iron. 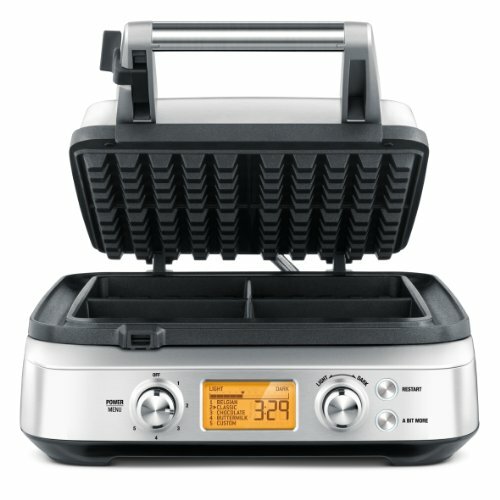 Cook until your waffle iron indicates that the waffles are ready, or until steam stops coming out of the sides of the waffle iron, about 4 to 5 minutes. Open the waffle iron and carefully lift the edge of a waffle with a fork to remove the waffles from the waffle iron. Serve with warmed maple syrup and a side of apple sauce or apple butter. Hello! All photos and content are copyright protected. Please do not use our photos without prior written permission. If you wish to republish this recipe, please rewrite the recipe in your own unique words and link back to Pumpkin Waffles on Simply Recipes. Thank you! So good! And we all loved the applesauce for serving, one of my toddlers even preferred it to the maple syrup and kept dipping in the applesauce instead! Thank you! I made these tonight to go with our Chicken and Waffles. They were amazing! The crunch of the cornmeal really complimented the pumpkin spice and the maple syrup. The only changes I made were to make the waffles dairy free. I used Ripple Half & Half to replace the buttermilk and Earth Balance to replace the butter. Completely amazing waffles with terrific flavor! I served them with just apple butter. There was no need for syrup. My family loved them and ate every crumb. Next time, I’ll double the recipe and freeze the extra waffles for easy breakfasts on weekdays. Elise, we made these today, and they were SO good! I am amazed at your recipes, yet to try one that didn’t turn out well. I have never made a pot roast before so trying your brisket recipe today, fingers crossed that it turns out well!! Hi Reir, I’m so glad you liked the waffles! These were AMAZING!! I ground the grains and made flour so they were really whole wheat. The whole family is in love with them. I’m so glad you liked them Deb! WoW..yes, it is a bit labor intensive, but what an outcome. Never used buttermilk before but am sure it makes a difference.Cooking is a bit of chemistry so go with the recipe. Be sure to leave the waffle in the iron a bit longer than you think for proper crispiness. The cornmeal adds a bit of crunchy, whole grain mouth feel to the experience. Might try a bit of vanilla extract, as Carsan suggested above. For a real cardiac effect, serve eggnog w/Myers rum ! House smells wonderful and they are delicious! Thank you! This sounds like a great recipe. The only thing I would change is to add a little bit of vanilla extract. It would give it a vanilla pumpkin spice taste. To top it off maybe put a bit of whip cream on it. I made these this morning and found the batter to be very thin. The resulting waffles – while pretty tasty – were quite soft and not with the crispiness on the outside that I normally like. I even cooked subsequent batches for longer times and they were still not crispy. No matter – I froze the extras and will toast them in toaster, which I think will make them crispy for future breakfasts. Because I LOVE pumpkin pie, I would likely add more spices next time to draw out that flavor more. This looks just incredible–the only problem is, I’m still shopping for a waffle iron! I have trouble trusting Amazon reviews, but your advice is always great. What kind of waffle iron do you have? Can’t help you here. I use a waffle iron that I’ve borrowed from my parents that is no longer sold anywhere. Made these this morning and they were the BOMB! I didn’t have any cornmeal, so subbed ground flax seed which gave them a bit more richness. I was short of buttermilk too, but subbed 1% milk for the rest and they came out fine. Light and fluffy, if you like them that way. Cornmeal may have made them crunchier. I had some homemade apple butter which we used along with butter and the flavors were wonderful together. Thanks Elise! Great flavor. Consistency was a little thin for me, but I just cooked my second pouring a minute longer to crisp them up. Delicious! Can I make this as a pancake? I don’t have a waffle maker. If I made this as a pancake, I would leave out the cornmeal (who wants crunch in a pancake?) and maybe thin the batter out a bit with some milk or water. No Valerie, you can’t make the batter ahead. The leavening won’t work if you mix it ahead. But you can get it ready ahead and then finish assembling it in the morning. The night before, mix up the dry ingredients and set them aside on your kitchen counter. Then in the morning all you have to do is mix up the wet ingredients and finish the batter. I always make pancakes and waffles this way. Good luck. Do you think this batter could be whipped up the night before, stored in the fridge and cook the waffles in the morning? I remember a book about some cowboys in olden days that assembled batter for hotcakes the evening before. Not sure if fiction or not??? Thank you! I love the sight and am at it every day, but I am a diabetic and am searching high and low for blogs by people like me. If you or anyone can tell me where to look I would be so thankful. Keep up the good work because you give me a reason to smile every day. The best site I know for low-glycemic recipes is my friend Kalyn’s Kalyn’s Kitchen.